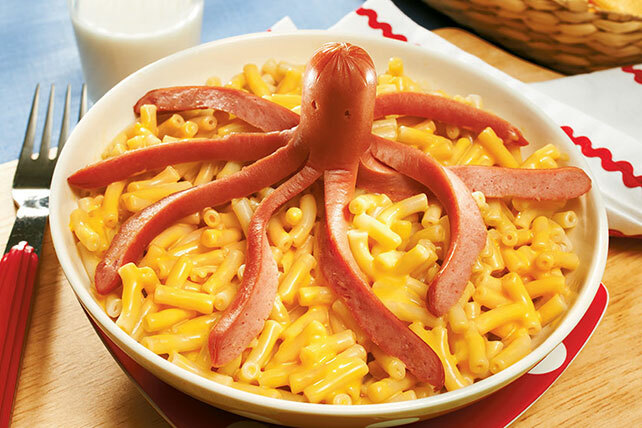 Put some playtime fun into their mealtime with Mini Hot Dog Octopus Mac 'n' Cheese. Mini Hot Dog Octopus Mac 'n' Cheese is the perfect kid-friendly dish for parties, kid-centric occasions or as a special entree during the week! Cut wieners lengthwise in half, starting each cut about 1 inch from 1 end of each wiener. Roll each wiener one-quarter turn and cut a second lengthwise cut, again starting about 1 inch from uncut end. (This will form the 4 legs of each octopus.) Use sharp knife or kitchen shears to cut each leg lengthwise in half, about 1 inch from uncut end, creating a total of 8 legs in each wiener. Poke 2 holes into the uncut portion of each wiener for the eyes. Prepare Dinner as directed on package. Meanwhile, add wieners to separate saucepan of boiling water; cook as directed on package, watching each wiener turn into an octopus right before your eyes. Save time by preparing with 4 single-serve packets of KRAFT EASY MAC. Prepare the Dinner following the Light Prep directions and using OSCAR MAYER Light Wieners.